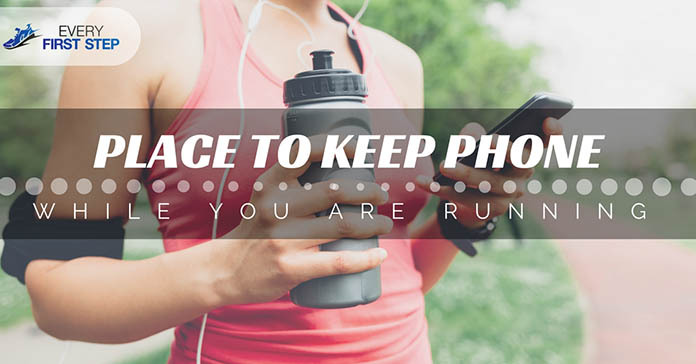 In today’s world where people cannot live without their gadgets, finding a safe place to keep your cell phone when you are running is a problem you need to solve. Being able to carry your phone even when you are running safely is not only safe but a smart decision. It is crucial that you select the most practical solution for your phone storage. We’ve put together a list of five of interesting places where to put your phone when running. There are many advantages of being able to carry your valuable possessions when you run. For example, in the case of emergency, you will always be available to your friends and family even during your run. Another benefit of having everything you need when your run is that you will be ready to do other errands immediately after your run since you have your wallet and phone with you. If you are planning to meet anyone after a run, having a cell phone handy can be valuable indeed. Before we get into where to put your phone when running, let us first clear some ideas that you may have about phone storage. If you have done any of these before, please stop it right away. They may sound like good ideas but read on to learn why they aren’t. You may think that that it is a good idea to wedge your phone in the elastic part of your shorts around your waist. However, the fact is that once you wedge your gadget in your pants, it will fall down. In addition to this, carrying anything in your pants is sure to be uncomfortable, so we discourage this option as well. People who run with their cellphones in their hands, likely have the idea that they can get them out anytime for a quick selfie or a timer. Although this sounds like a good idea, your hands will get moist with sweat, and in the worst case scenario, the phone will likely slip out of your grip and crash into the road. Have ladies you thought of showing that phone down your bra? Please don’t! Your breasts sweat so much so your phone can quickly submerge in sweat which is never a good thing. This is nearly impossible. Your phone will never survive the amount of pressure your shoes take. Approximately, you take about 2,000 steps per mile. Imagine having your phone take the same slaughter. Compression socks are usually tied around the calf area to help increase the flow of blood. There is no guarantee that your phone will stay put in your sock not to mention the high possibility of ending up with a phone print on your skin afterward. The facts are clear. There may be places that seem logical for phone storage and perhaps they even worked for you, but this doesn’t mean that they are good ideas. So where should you put your phone when running ? Some people may be comfortable running with a backpack while others find this difficult. ​On the other hand, some may want their hands to be free while others don’t mind holding on to something. When it comes to keeping your cell phone close to your body, some people find this uncomfortable while others prefer it. There are no ru﻿﻿﻿﻿﻿les to follow, just select the solution that works for you. With these tips in mind, here are five of our favorite places to store your phone and other valuables during a run. These have been proven by runners to be safe and secure. Remember we said not to put your phone inside your bra when running because of all the sweat? Well, there is an exemption to this- a sports bra. The beauty of a sports bra is that there are designed with extra pockets to carry valuables such as your cell phone. Many sports bras have secret, hidden pockets sewn inside the chest to allow for easy access and convenient storage. In addition, these pockets also are usually separate from the bra itself which saves you from worrying about a sweaty cellphone. The lining of these bras ensures that sweat stays independent. No matter how long your run is, you can safely store your cell phone inside such a bra. The reason why holding your phone in the palm of your hand as you run is discouraged because of the chances of it flying out your hand and into the pavement. The solution to this is using what are called wrist wallets. These wallets are technically wallets that fit around your wrist with a band. It often has two pockets- one in the front and another in the back. The back pocket often has bigger storage space and is ideal for holding electronics. The front side of the pocket is smaller and can store your keys and other smaller items. It is a great idea for those who are going on longer runs and need lots of storage space. These are one of the latest things in fashion in the sports world. They are straps that fit around your waist and allow you to carry one or more water bottles in them. The great thing is that they also have extra pockets where you can safely store valuables like your cellphone, keys and wallet. Hydration belts are one of the best ideas when it comes to having everything accessible in one area- your waist. For some, however, carrying stuff in their waist is uncomfortable, so it is a matter of personal preference. Instead of storing your phone at the back of your shorts or compression socks, another option you have is to get clothing that has secret pockets. We’re not talking about turning to jackets and shorts which are bulky when you run but using your regular attire with a twist- a secret pocket. Speed shorts, for example, can come with a so-called ‘second skin’ that has an open top front pocket big enough to store your cell phone. This way, you have it close to your body and don’t have to worry about it flying to the pavement. If you are comfortable wearing a backpack while running, then a CamelBak may be a good option for you. These are backpacks like gadgets that have an inner portion for storing water and a pipe that goes to your mouth for easy drinking. The outer part of the CamelBak often comes with multiple safe pockets where you can store items as large as extra clothing and off course your cell phone. These packs come in different sizes to fit your body size and needs so there is something for everyone. What did you think about our list? Which method have you tried and found comfortable? Please share your thoughts in the comments below. If you enjoyed this article, do share it with friends and family too.